Daily contact lenses are single-use lenses designed to be worn and replaced each day for clear and comfortable vision. 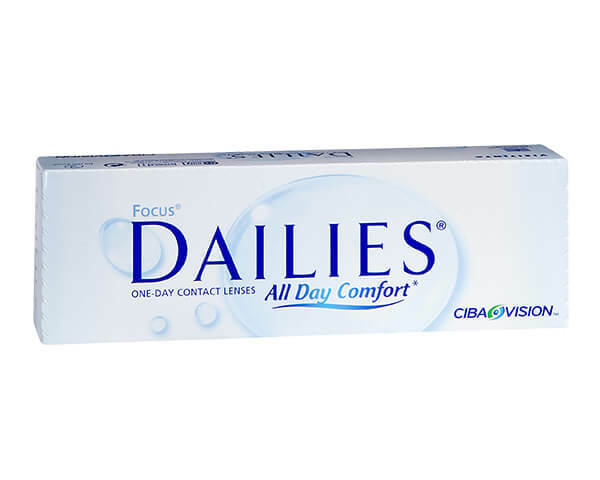 We stock a wide range of daily lenses including 1-Day Acuvue Moist, Focus Dailies & Dailies AquaComfort Plus. Watch this video for advice and tips on buying and wearing daily contact lenses. Daily contact lenses are lenses designed to be worn for just one day before being disposed of. 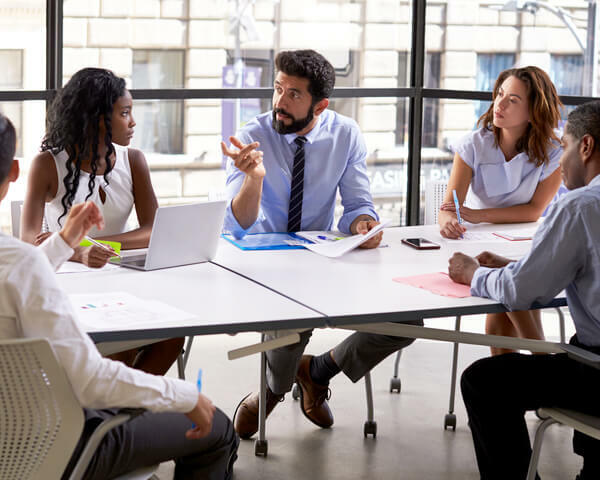 You might have heard them referred to as ‘dailies' or ‘daily disposable lenses' and there are also brands of contact lenses that use ‘Dailies' in their names which can make it a little confusing. The most important thing to remember is that these lenses are for just one use each. How long you can wear them for each day depends on the brand, but some can be worn for as long as 16 hours per day. Once you've removed them they can be replaced with a fresh pair, but you should never use the same ones again. It's well known that it's best to replace contact lenses regularly, but it used to be far too costly to dispose of them often. As a result, cleaning solutions and rewetting agents were created to get a longer lifespan from lenses without compromising on hygiene and safety. Thanks to modern materials and engineering processes, contact lenses can now be made for frequent replacement at a reasonable price. What vision problems do daily contact lenses correct? Why choose daily contact lenses? Many people choose daily disposable lenses because they offer a high level of cleanliness. Although monthly and 2-weekly contact lenses are hygienic and comfortable to wear, they can't match a daily lens for consistent performance. There is no avoiding the fact that the longer you wear contact lenses, the more likely a build-up of protein deposits or debris becomes. Of course, your lenses can be cleaned to minimise the effects of this and they'll be safe to wear, but there's a chance they won't feel quite the same as the first time you wore them. Even the most rigorous of cleaning schedules can't match the fresh feeling of wearing new lenses, whether they're premium or relatively cheap daily contact lenses. Dailies don't only ensure hygienic wear, you can feel the difference between them and monthlies if you change over. You can also expect a consistently higher quality of vision with daily contact lenses. Due to exposure to both the elements and your eyes, over 30 days you may notice a slight deterioration in the quality of vision with a monthly lens. As you wear a new pair of daily lenses each day your sight remains as crisp and clear at the end of the month as it is at the start. People often like to wear daily contact lenses for sheer convenience. Without the need for cleaning and storing in solution at night, you can simply dispose of your lenses and get into bed. Then, the next day, just open a new container and pop in your clean lenses. There's no effort required and you can be sure of perfect, comfortable vision each day. Daily disposable lenses are also a great choice for less regular contact lens wearers. If you don't wear them every day it can be easy to lose track of when you need to replace monthly or two weekly lenses, as they can only be worn for 30 or 14 consecutive days respectively. As single use lenses, you can leave weeks between each wear without your contacts expiring, which is handy if you just wear contact lenses for sports or a night out. Which type of daily lenses you choose depends on what your needs are. If you suffer from dry or irritated eyes, it's important to make sure that your lenses won't exacerbate your condition. 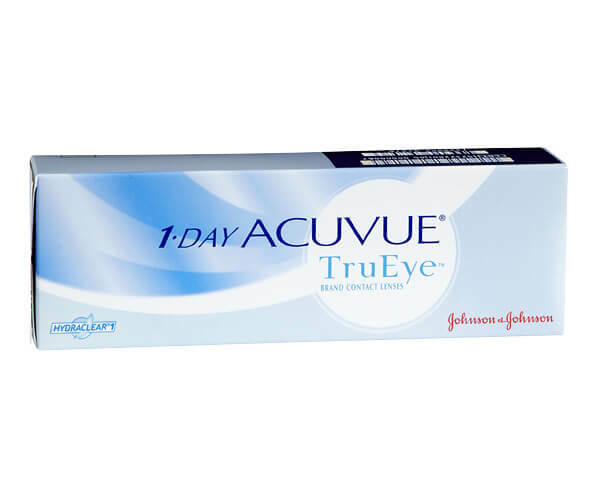 You should look for lenses that offer high levels of water content or oxygen permeability, such as 1-Day Acuvue Moist, Dailies AquaComfort Plus or 1 Day Acuvue TruEye. As UV damage is cumulative, everything you do to protect your eyes will help to prevent deterioration caused by high exposure. While sunglasses are always the best form of defence, you can choose daily contact lenses that also include UV blocking technology to provide an extra layer of defence against sun damage. 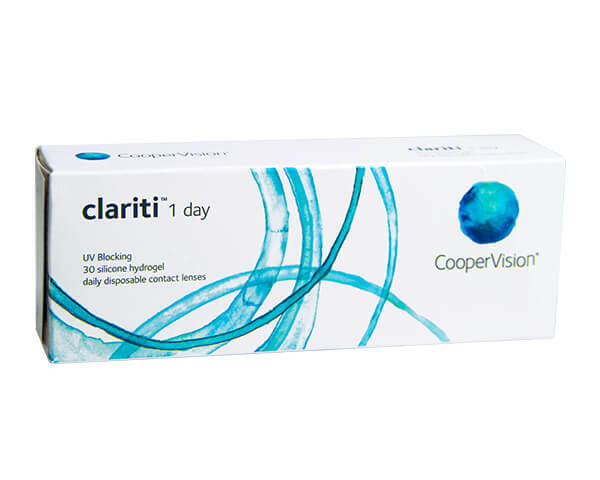 Good daily disposable lenses with UV blocking include Clariti 1 Day and 1-Day Acuvue Moist. Some brands, such as 1-Day Acuvue Moist and Proclear 1-Day also have handling tints. 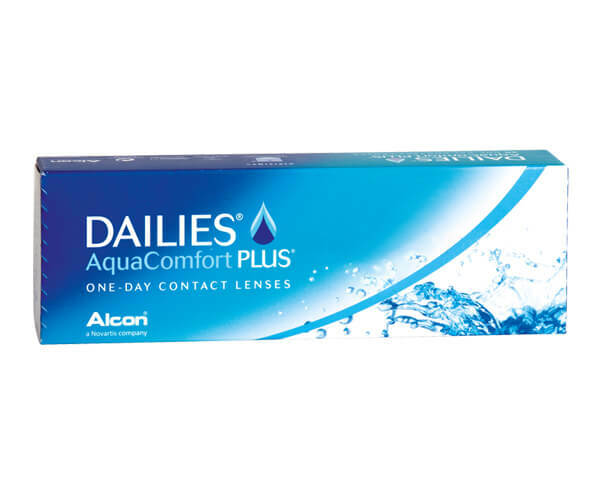 These make applying your contact lenses the right way around considerably easier, and so these daily lenses are an excellent choice for first time wearers. Of course, one of the biggest factors that comes into buying daily contact lenses is the price. While dailies are usually more expensive than monthly lenses, there are plenty of high-quality, yet affordable options for you to choose from. 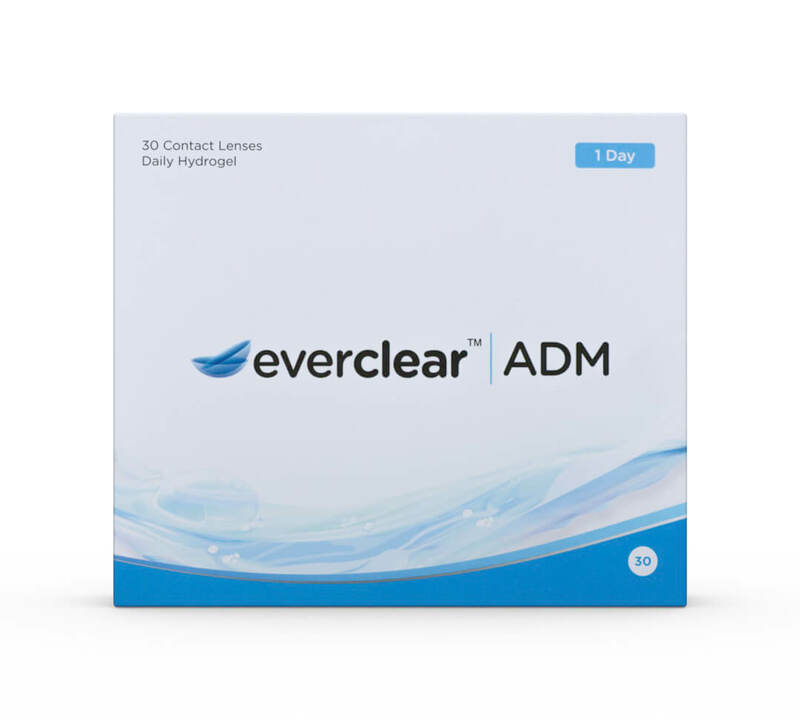 everclear ADM provide affordable lenses that still provide the utmost comfort and the highest quality of vision. Some daily contact lenses, such as 1-Day Acuvue Moist and Proclear 1 Day, are made from a soft material called hydrogel. This material has been around for a while, but manufacturers are creating new hydrogel lenses that are popular today. Manufacturers often choose hydrogel lenses as they retain high levels of water so they are often chosen by people who suffer from dry eyes. Silicone hydrogel daily contact lenses are among the most popular types of lens and are often chosen for their breathability. These daily lenses let a greater amount of oxygen permeate through the lens to reach the cornea, resulting in white eyes that look and feel healthy. If you have a pronounced astigmatism then you will require specially designed contact lenses that fit your eyes securely and stably, called toric lenses. These come in a variety of wearing patterns including as a daily disposable lens. 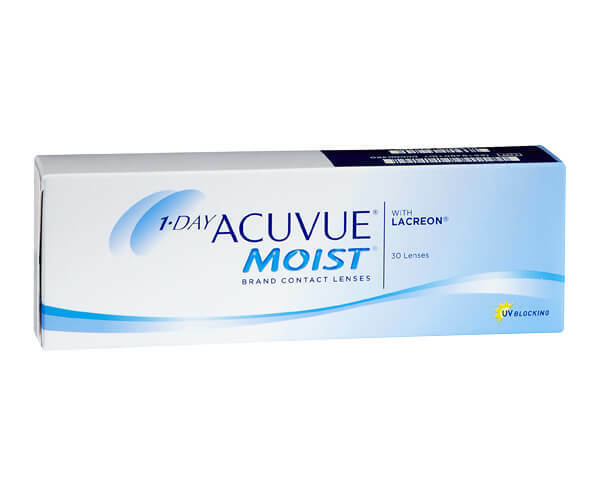 Many of the top brands of daily lenses come in toric forms, such as Acuvue Moist for Astigmatism and Proclear 1 Day Toric. Rather than use bifocal or varifocal reading glasses you can also use multifocal daily contact lenses to correct sight affected by presbyopia. These lenses make it easy to focus on both near and distant objects without needing glasses. 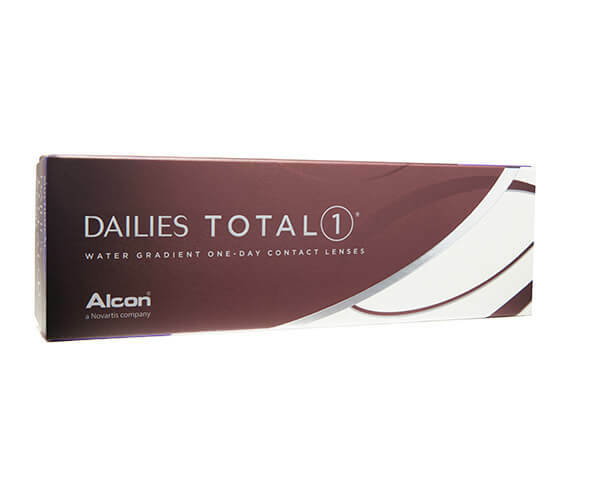 Like toric lenses, many of the top brands of daily lenses are available in multifocal form such as 1-day Acuvue Moist Multifocal and Dailies AquaComfort Multifocal. 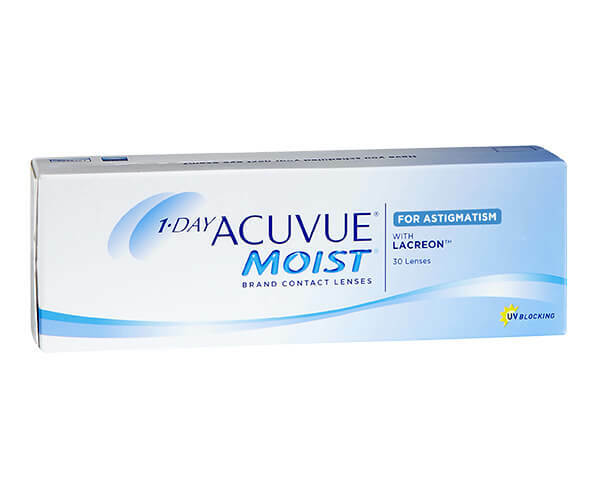 1-Day Acuvue Moist use LACREON® technology to create a moisture cushion between the eye and lens, making them suitable for those with dry eyes. They also have a 1-2-3 indicator to make application easier. Made from light, flexible material to fit securely, Focus Dailies use blink-activation technology to gradually release moisture into the eye. This makes for a comfortable wearing experience that keeps your eyes feeling hydrated. Made with a high water content, these lenses are ideal for dry eyes. They have an ultra-thin lens design to ensure a comfortable and secure fit and a handling tint to make putting them in quick and easy. These lenses are made from silicone hydrogel for an ultra-breathable lens, which also includes a high level of UV protection to help reduce sun damage. HYDRACLEAR® 1 technology provides moisture to ensure healthy and comfortable eyes. These toric lenses combat the effects of astigmatism while using LACREON® technology to form a moisture cushion that keeps your eyes hydrated. They're specially designed to keep the lens stable for consistently clear vision. 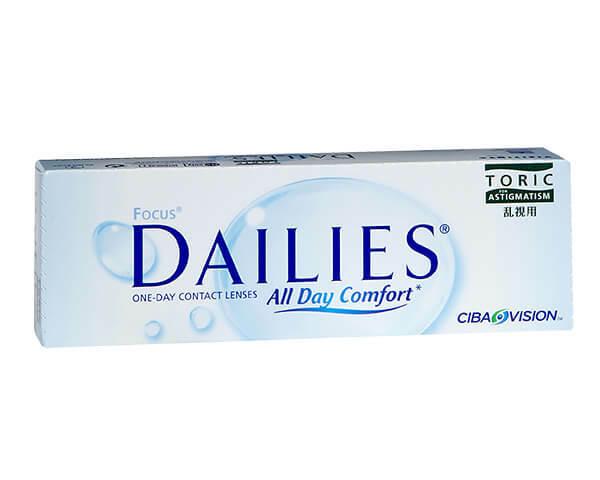 Dailies Total 1 are the world's first water gradient lenses and keep your eyes fully hydrated throughout the day. With an ultra-smooth surface to stop friction from blinking, these exceptionally comfortable lenses can be worn for up to 16 hours a day. These great value lenses offer the convenience of daily wear at a low price. Their high water content helps to maintain eye moisture throughout the day, and they're made from soft hydrogel for a comfortable and secure fit. These flexible silicone hydrogel lenses fit your eyes comfortably and securely with added UV blocking for an extra layer of protection against harmful UV rays. WetLoc™ technology locks moisture into the lens material so your eyes can stay healthy throughout the day. 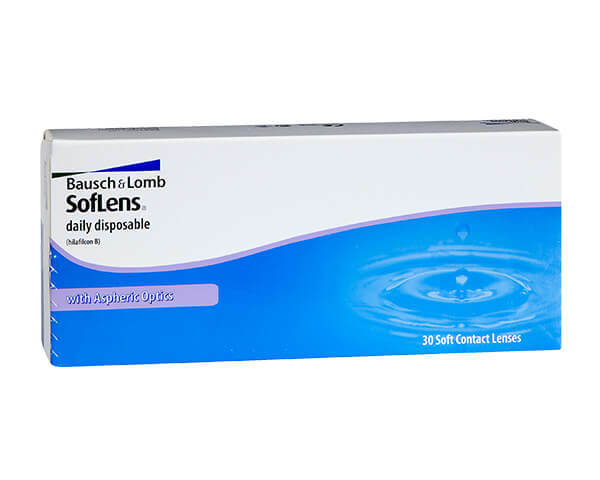 SofLens Daily Disposable use ComfortMoist™ technology to maintain hydration in your eyes all day. Their high definition optics reduce blurriness, glare and halos for clear vision, while a thin lens surface ensures comfortable fit. These toric lenses are designed to provide clear vision for people with astigmatism, with an advanced lens design for a consistent and comfortable fit. They're made using Lightstream® Technology to create a thin lens surface that resists protein build-ups.